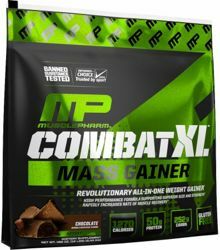 Maltodextrin, Protein Blend (Whey Protein Concentrate, Milk Protein Concentrate, Micellar Casein, Hydrolyzed Whey Protein Isolate), Peanut Flour, Cocoa Powder, Natural & Artificial Flavors, Coconut Creamer (Coconut Oil, Corn Syrup Solids, Sodium Caseinate (a milk derivative), Mono Diglycerides, and Sodium Silico Aluminate), Salt, Gum Blend (Cellulose, Xanthan), Alfalfa Sprout Powder, Sweet Potato Powder, Inulin, Chia Seed Powder, Quinoa Powder, Brown Rice Flour, Medium Chain Triglycerides (from Coconut), Flax Seed Oil Powder, Enzyme Blend (Protease, Amylase, Lactase), Caraway Seed Powder, Ginger Root Powder, Acesulfame Potassium, Sucralose. 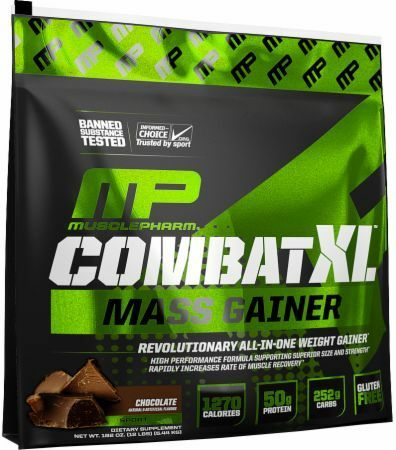 MusclePharm Combat XL is a revolutionary weight gaining supplement formulated with dense, functional calories and essential nutrients partitioned precisely to create the perfect muscle building environment an athlete needs. Featuring essential fatty acids, complex carbohydrates, and 4 sources of protein, Combat XL works to promote muscle recovery allowing you to get big – and stay big!